IFTER’s Summer 2014 Intern, Mei Mei Pollit is the guest blogger for this post which gives you a peek at some fresh, new, and very modern theatre in Moscow. I spent the month of June and part of May in Moscow, seeing lots of theatre, taking Russian classes, and working on a research project which you can read about here: evameilingpollitt.wordpress.com. This blog post is dedicated to a few great young theaters in Moscow. You may have already heard of the historic Chekhov Moscow Art Theatre, but have you heard of the Gogol Center? Or the Shkola Dramaticheskova Iskustra (The School of Dramatic Art)? Some of my favorite work in Moscow was performed at these newer and younger theatres. Below, read about them and what I saw while I was there. That is the theatre’s mission statement. Renovated from the former “Gogol theatre” under new director Serebrennikov in 2013, the Gogol Center today works to provide a place that engages the community and a place where art can tread new frontiers. 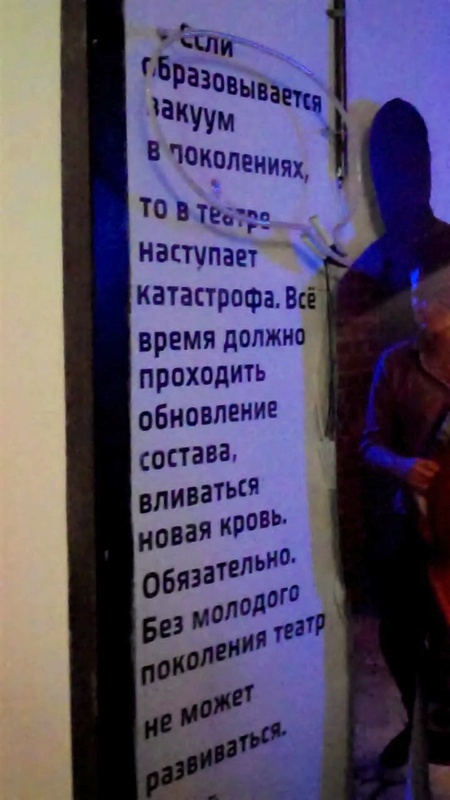 There is a café, a bookshop, and quotes mounted on the walls from famous contemporary theatre artists, discussing the role of theatre or the role of the Gogol Center. The opening montage of Dead Souls used rubber car tires. You can read more about the Gogol Center, and all of their performances, on the English version of their website. ^From Anatoli Vassilev, founder of the Школа. Vassilev opened the “Школа драматического искусства” in 1987 with a performance of “Six Characters in search of an author” which presented new theatrical methods and techniques that established the school as a place of experimentation; a Лаборатория (lab) as well as a Школа and Театр (school and theatre). 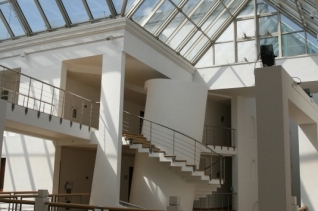 In 2001, the school moved to a newly constructed building that is full of skylights, stairs, and interesting angles. I saw two productions at the school while in Moscow, one in a small studio lit by candles, and the other in a large gymnasium with semi-circle wooden risers. A picture of the inside of one of the lobbies. The first show I saw at the school was ГЕРОИДЫ. ТАНЦЕВАЛЬНЫЕ ПИСЬМА (Heroides. 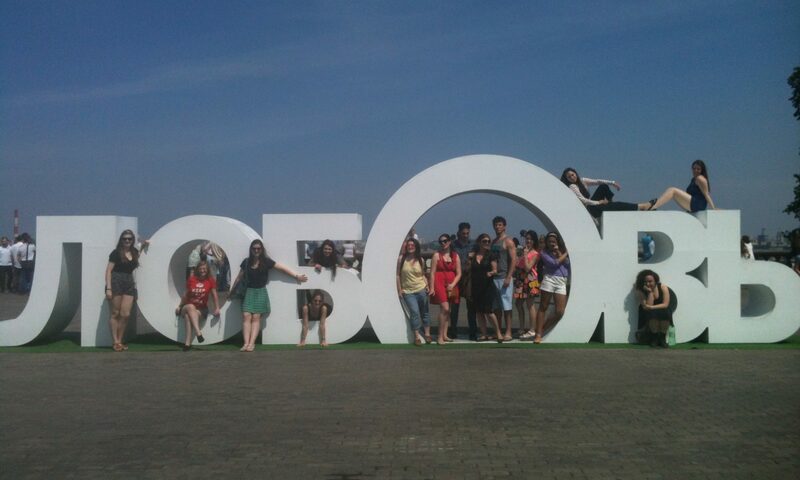 Dancing Letters.) It took “Heroides” by Ovid- a collection of 15 “love letters” from Greek and Roman mythological heroines- and transformed the letters into a solo dances. Each dancer took on the role of a heroine and came out to dance for a 15-20 piece to music that was performed live and had been composed after the choreography (so that the music was made for the dance instead of the dance made for the music). The choreography was bursting with a raw, ugly, and fascinating feminine sexuality that experimented with costume and hair in new ways. An entire dance from Heroides was performed with the performer’s hair swallowing up all her face. 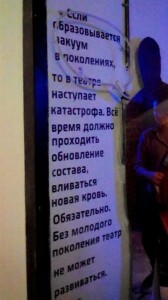 The second show I saw at the school was КАК ВАЖНО БЫТЬ СЕРЬЁЗНЫМ (The Importance of being Ernest). A Russian interpretation of the Oscar Wilde masterpiece, the play was performed in a gymnasium and was staged in a way that broke all rules of “realistic” movement. The characters moved in a way that was true to the action, but their world was a place where chasing and running in huge circles or vibrating in movement groups against the floor could be paired with dialogue from 19th century British Society. There were also several physical montages and a live piano that responded to the characters in a way that made the pianist a character as well. Gwendolyn refuses Jack, after finding out he lied to her about his name being Ernest. Their words may not have taken them to kneeling on the floor, but their objectives and emotions have. More information (Russian language only) and more production photos here. Gogol Center and the School of Dramatic Arts are Muscovite leaders in breaking preconceived notions of what theatre “should be”, however most of my experience with Moscow theatre provided some sort of theatrical experimentation or novelty that I hadn’t seen before. Streetcar named Desire at the Chekhov Moscow Art Theatre had real people embodying Blanche’s ghosts, so we saw the experience of her insanity embodied; London Show at the Satirikon preceded its first dialogue with 10 minutes of the actors communicating in strong physical gestures and gibberish, etc. It is important for American theatre artists to go to Moscow and see theatre like this because it broadens their perceptions on what theatre can be. 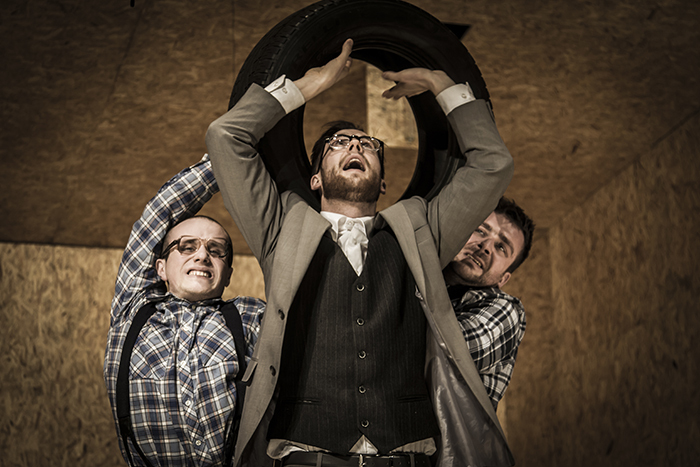 Seeing one’s own idea of theatre “rules” get broken inspires one to return home and tread new frontiers of their own. IFTER does not own any of these photos. They are for reference only.